Students will make a Sun-Catcher about five inches in size. 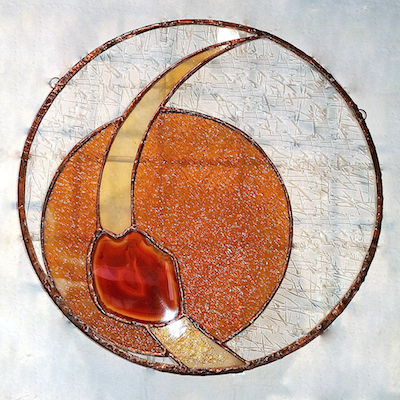 This class teaches you the basics in Stained Glass; how to handle glass, choose colors and textures, cut and fit the glass to patterns, grind, wrap copper foil, solder, patina and polish a stained glass piece. It is a hands on class and normally takes about 5 hours. Bring your creative spirt and have fun, everything you need to complete your project is included! At the end of the day you will have created your very own one of a kind sun-catcher!